Calpentyn Road, on the West Coast of Ceylon. The East Coast of Ceylon, from Venlos Bay to Batecalo, with the Banks, Rocks, Soundings & ca. This is a fine example of Laurie and Whittle's 1794 nautical chart or maritime map of Calpentyn Road (Kalpitiya) on the western coast of Sri Lanka and of the east coast of Sri Lanka from Venlos Bay (Vandelous Bay) to Batecalo (Batticaloa). 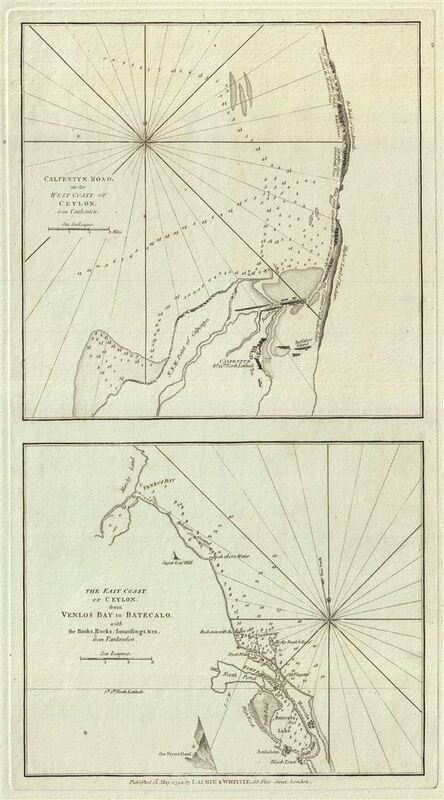 Essentially two maps on a single sheet, the upper map details the region of Kalpitiya, depicting the fort, Buffaloes Island, and the shore of the Caradive Island. The town of Kalpitiya and the Kalpitiya Peninsula are today part of the Puttalam district of Sri Lanka and contains one of the largest lagoons of the country. The lower map details the east coast of Sri Lanka from Vandelous Bay to Batticaloa. It notes the Batticaloa Fort, built by the Portuguese in 1638, and is still one of the most picturesque small Dutch forts in Sri Lanka. The map also identifies Black Town, Sugar Loaf Hill and Batticaloa Lake (possibly Batticaloa Lagoon, whose two openings into the sea dry up during the dry season, causing it to become land locked). The region at the time was controlled by the Dutch, who in 1658 captured the Batticaloa Fort. Eventually in 1798, two years after the making of this map, surrendered the colony to the British. The map offers rich detail including countless depth soundings, notes on the sea floor, rhumb lines, shoals, buildings, place names and a wealth of other practical information for the mariner. As noted in the title, Laurie and Whittle derived the map from a much earlier 17th century plan by the Dutch East India Company chart maker Johannes van Keulen (1654-1715). This map was published by Laurie and Whittle from their offices at 53 Fleet Street, London, on May 12, 1794. It was issued independently as well as offered in their 1797 East-India Pilot, or Oriental Navigator. Very good. Original platemark visible. Two maps on one sheet.